Unless they can quadruple the W&C, that's really going to be a lot less use that I thought. Potential future Aldwych...? current values of yupp for purchasers/tenants unknown, but assuming they will want to be yuppies when they move in regardless of current status. For Zone 2 (let alone Zone 1, as we are told BPS station will be) Queenstown Road and Battersea Park are not exactly busy at the moment. Indeed Queenstown Road's annual entry/exit figures of 1.5m are lower than all but two Underground stations (Roding Valley and Chigwell), with Battersea Park's of 1.8 million just edging it above Grange Hill. Even by NR standards they are underachievers - they are the second and third least-used of the eight stations in LB Wandsworth, (after Wandsworth Common), their figures being more comparable with those in the outer suburbs at Whitton and Wallington. Nearby Clapham Junction had nearly 30 million (just short of the average for a Tube station, and falling between the figures for Russell Square and Leytonstone, but of course it does not include interchanges). 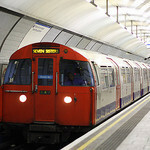 The respective operators would, I expect, be quite happy if local passengers changed their allegiance to the Northern Line (which is likely, as it would charge lower fares because of the TOC premium), and thereby justify running more trains non-stop from Clapham Junction to Victoria/Vauxhall. "“In isolation the Northern Line Extension project is still on time and working towards a December 2020 finish,” the source said. “However, instead of doing a big bells and whistles unveiling then it will be realigned with the completion of works at Bank station." Eh? I don't see how the NLE is "on time" given the developer of Battersea Power Station (BPS) forced a redesign of BPS tube station. We know from past LU reports that this forced a redesign causing a delay while that work was done. It has also caused an increase in cost. LU was signed up to a fixed "in service" date for the full extension which it couldn't meet. If nothing was wrong why did a plethora of decisions need sorting in a NLE paper at the last Programmes and Investment meeting? I assume the developer and LU have reached a commercial settlement which covers LU's extra costs, removes the risk of breaching the "in service" date agreement by changing the date. LU may be taking the view that its works are "on time" except for the impact of an external change which is one way of describing things but it's a tad dubious to me. I also have a sneaking suspicion that traffic on the extension is not going to be as forecast anyway. We know the property market is struggling especially at the expensive end and that Chinese and Malaysian investors are not enthused about prospects for the Battersea / Nine Elms development. I'm not expecting trains on the extension to be "full" for a very, very long time. I'd not be shocked if a fair slice of the traffic comes from people reaching the stations by bus from the much wider local hinterland. I think there is also another factor in play which is timetable changes. It must make sense for LU to try to minimise the number of timetable changes to cope with the revised layout / run and dwell times resulting from the Bank works and also Battersea Power Station. Doing it as one overall package makes a lot of sense given the need to change maintenance regimes to provide trains for the extension, driver rosters and the signalling and control system to reflect the new timetable. Doing it as one rather than 2 or 3 separate changes must also save a lot of time, effort and money. The author has deleted it. It was a report that things are delayed such that everything will complete simultaneously. Eh? I don't see how the NLE is "on time" given the developer of Battersea Power Station (BPS) forced a redesign of BPS tube station. We know from past LU reports that this forced a redesign causing a delay while that work was done. It has also caused an increase in cost. LU was signed up to a fixed "in service" date for the full extension which it couldn't meet. If nothing was wrong why did a plethora of decisions need sorting in a NLE paper at the last Programmes and Investment meeting?. I was quoting the report in the NCE - Whether that is right or wrong I don't know, but the article itself didn't support the idea that there are problems. On the subject of usage, I'd say that there is a *lot* of building work going up now round there. A lot of which is coming too completion, and most of that will have been forward-sold, so I think a lot of it will be occupied in the next 12-18months, even if not at the rates that were expected. Sold, yes. But if they were bought as investments, they might not be occupied. I'd not be shocked if a fair slice of the traffic comes from people reaching the stations by bus from the much wider local hinterland. There is a project to add WiFi and 4G coverage to the Waterloo and City line, and Crossrail will have these when it eventually opens, but I've not been able to immediately find whether the Battersea extension is being built with them or not? Im under the understand that wifi is for stations (like existing) but 4G is based on the trains for Crossrail and altered trains for the Drain. Rest if the network is still be to fitted with the required equipment for on train stuff. Can't remember what I read them from but it's from a TfL document.